Last updated by Mark Jala at December 14 . Calphalon Simply Calphalon cookware represents a more budget oriented series of cookware product lines. There are several “Simply Calphalon” cookware lines ranging from enameled cast iron, stainless steel and a couple different nonstick cookware lines. The nonstick cookware is double coated whereas the Calphalon Unison cookware product line is triple coated and more solidly built. Calphalon’s signature hard-anodized aluminum construction for excellent conductivity and even heating. The interior surface is double-coated with Calphalon’s sturdy, reliable nonstick coating. I’m not a big fan of the Simply Calphalon series of cookware. As reviewers are split on the quality, it means that while it might be OK as starter cookware, more experienced home cooks probably won’t get a lot of life out of Simply Calphalon cookware. If you are on a budget, consider the Farberware Classic Stainless Steel cookware or the Farberware Millennium cookware. The following dashboard is for the Calphalon Simply Calphalon anodized aluminum nonstick cookware line. Calphalon Unison nonstick cookware is quite innovative. With 2 types of triple coated durable nonstick surfaces, a cook can now sear with one utensil and cook delicate foods with another, both to perfection. The anodized aluminum shell naturally distributes heat very well minimizing hot spots. The “Slide Nonstick” surface on the omelette pans is great for delicate foods like fish and eggs. The “Sear Nonstick” surface on the saute pans are for higher heat cooking where a cook would want to brown the food. This is the only cookware that has two types of surfaces. It really does allow a cook to be creative with the same cookware set. Calphalon Unison Nonstick cookware has stay-cool handles and can handle an oven temperature of 500 degrees. This is very solid cookware for all kinds of home cooks. Handles stay comfortably cool on the stovetop. This is Calphalons best nonstick cookware. The anodized aluminum distributes heat very well and the 2 types of nonstick surface allows the cook to use more cooking methods with the same cookware. Unison cookware is built with 2 different nonstick surfaces for different cooking tasks, so you can use healthy, easy-to-clean nonstick to cook with professional precision. Ultra-smooth Slide pans release foods effortlessly for tender omelettes and delicate sauces. Specially-textured Sear pans seal in flavor and provide perfect browning of meats, fish, and vegetables. Long, quadruple-riveted stainless steel handles stay cool on the stovetop. All cookware is dishwasher-safe and carries Calphalon's full lifetime warranty. Calphalon Tri-Ply Stainless Steel Cookware is fully clad stainless steel cookware suitable for mid to upper experience levels of home cooks. It is top quality and easy to use once one gets used to how well fully clad stainless steel cookware heats up and evenly. Glass lids make it easy to see food as it is cooking. The handles are comfortable and easy to balance when fully loaded with food. Calphalon Tri-Ply Stainless Steel cookware is good cookware that can be used with all cooking methods. I enjoy using the Calphalon Tri-Ply Stainless Steel cookware. As with all stainless steel cookware pick up some Bar Keepers Friend cleanser and you’ll have cookware that will last a lifetime. Aluminum core between 2 stainless steel layers provides even heating for excellent browning and control of the cooking process. Non-porous stainless steel cooking surface is safe for use with all utensils. Elegant brushed stainless steel exterior on pots and pans can go from the oven or stove directly to the table. Reflective cook surface makes it easy to monitor foods as they cook and remains beautiful over time. 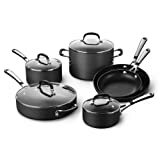 Includes 8-, 10-, and 12-inch omelette pans, 1 1/2- and 2 1/2-quart sauce pans with lids, 3-quart chef's pan with lid, 3-quart saute pan with lid, and 6-quart stock pot with lid. Long, brushed stainless steel handles stay cool on the stovetop. All cookware is dishwasher-safe and carries Calphalon's full lifetime warranty. Calphalon Contemporary cookware comes in nonstick, nonstick bronze colored and stainless steel. An innovative design makes Calphalon Contemporary cookware standout. Glass lids makes it easy to see the food as it cooks. A thick anodized aluminum shell in the nonstick and bronze version helps distribute heat very well and give the cook confidence in how it handles. The stainless steel version is fully clad providing superior heat distribution. Sturdy cast stainless steel handles stay cool. Reviewers are rather fond of Calphalon Contemporary cookware. Most reviewers love Calphalon Contemporary cookware. Whether nonstick or stainless steel, Calphalon Contemporary should serve most home cooks for many years. The following dashboard is for Calphalon Contemporary Nonstick cookware. Calphalon AccuCore Stainless Steel cookware is professional grade top-of-the-line cookware to rival the quality of All-Clad. Five fully clad layers, two stainless steel, two aluminum and one copper layer makes AccuCore professional grade suitable for any cook, especially those who require the best cookware. Triple riveted stay-cool handles provide balance and confidence to the cook. Calphalon AccuCore cookware is a great addition to confirm the solid reputation of Calphalon. Five layers with copper core for controlled, even heating. Long handles stay cool on the stovetop. It’s great to see Calphalon come out with a cookware line to challenge the dominance of All-Clad. This is professional grade cookware and a winner for Calphalon.